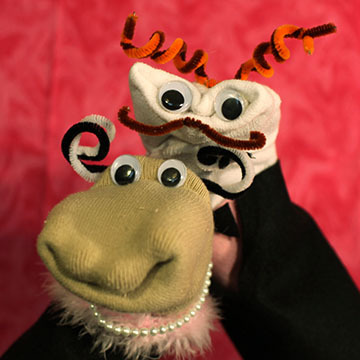 Since 2010, Sock Puppet Sitcom Theater has presented our brand of sit-comedy. Irreverent, absurd and silly our influences include Monty Python’s Flying Circus, Michael Gondry and South Park. Take classic sitcom pilot episodes add socks, googly eyes, pipe cleaners, live musical accompaniment, period news and commercials and you have a truly unique experience that is equal parts nightclub act, puppet show and sitcom. Company members are drawn from a wide variety of backgrounds including voiceover, improv, puppetry, cabaret, theater, media design and rock ‘n roll. Our repertory includes pilot episodes raging from the 1950s to the 1990s. During each show “producers,” Glamor Puss and Frenchie, lead the audience on a journey back in time to the year the sitcom premiered including musical medleys, commercials and news stories. The sock puppets often talk to the audience and expect them to talk back and sing along with the tunes. The show is accompanied by live band with keyboard, guitar and percussion/Foley who take licks and references from pop music of to back live singers during the theme songs and commercial jingles. Originally staged in Silver Lake art galleries the company became the “resident sock puppet company” at the Atwater Crossing and later moved its monthly show to The Echo in Echo Park. The company has also performed at Grand Performances, La Luz de Jesus Gallery, KPCC’s Crawford Family Forum, Sacred Fools Theater, Burning Man, iO West and Twenty Wonder.